TheArmenianKitchen.com : Mannix is back! This isn't exactly a food item, but it has been on my personal front burner since I discovered recently that the classic 1960s TV detective series Mannix is available on DVD. 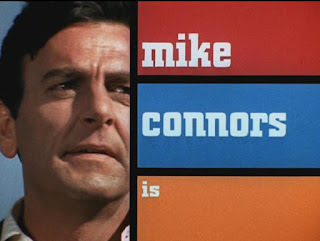 I loved this show when I was a teenager, in part because it was a great action series with lots of car chases but mostly because it starred the rugged and handsome Armenian-American actor Mike Connors, who has always proudly proclaimed his birth name as Krikor Ohanian. My favorite moment occurred right at the start of each episode, when Mike's name appeared on a red, blue and orange background in the exact pattern of the Armenian flag. To me, this was like getting a message in secret code each week! I imagined I was off on another adventure right along with this modern version of Sasuntsi David, the original Armenian superhero, except that Joe Mannix rode a Plymouth Barracuda instead of a horse. Mannix was almost always outnumbered and outgunned, but he never backed away from a fight -- and he always got his man. The third season of shows was released this fall and it's available in stores and from online sellers such as Amazon.com. (We get a small referral fee if you use our search form below.) The first two seasons are also available. The show ran on CBS from 1967 to 1975, so there should be plenty more to come.